Galina Krasskova is running an agon for Juno until February 14th, and I would encourage everyone to send a prayer or piece of art in Juno’s honor for this. This is my entry. 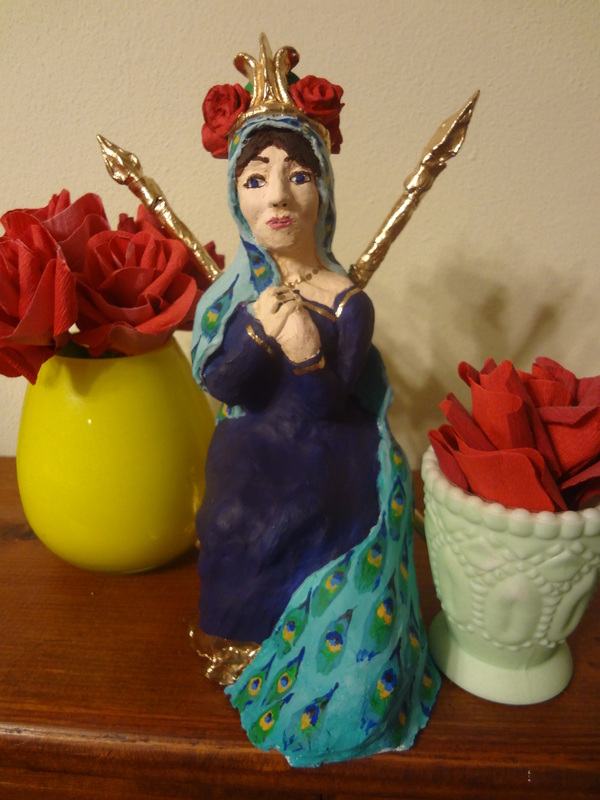 I’d been waiting for the statue’s clay to dry, and Galina’s announcement gave me the last little kick I needed to motivate me in completing this. For that I’m very thankful. This statue is going to be placed for the first time on my shrine tomorrow for the Kalends of February, which happens to be Juno’s die natalis, or birthday, as well. Both Juno and Janus recieve cultus in my home on the Kalends of the month, and She has a special place here, having been openly prayed to at my wedding to my mortal husband. I will have to remove the on a sunny day to put a protective coat over the paint, but I’m very pleased with how She turned out. It seemed natural to sculpt Her first. Lately I’ve been thinking about my return to art after so many years of walking away from art school. 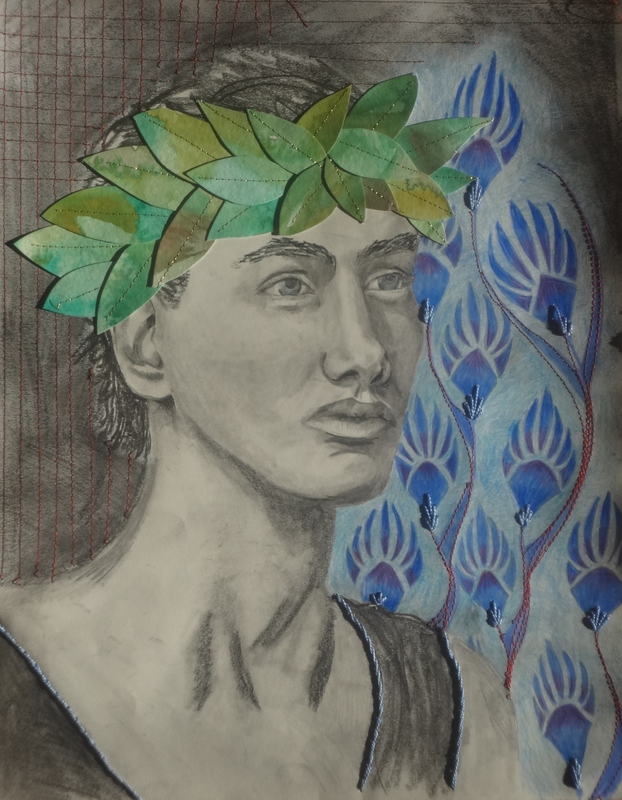 We were recently looking through my portfolio of work from my high school years, and most of the drawings and paintings were related to mythology. 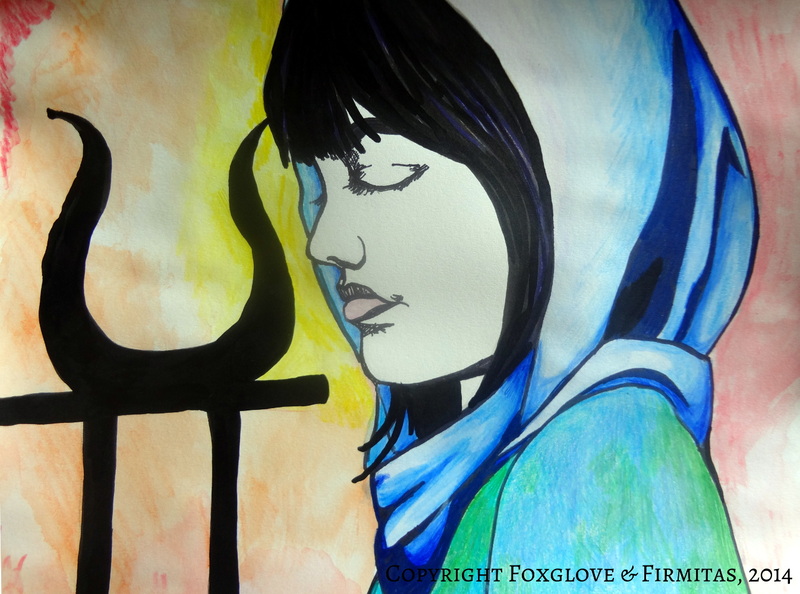 I’d always considered myself a figurative artist, but looking over it recently I realized that my focus had always fallen back to Deities and Spirits. I look back at my critiques in Chicago, and I think beyond my depression and pain I felt from my work being torn apart, I was told regularly my art fell in the genre of fantasy. I had (and still have) quite a bit of technical skill to master, and I was never unaware of that. However, I have always felt a sense of sacredness to the work I do in the realm of art. Meditating upon it now, I feel a deep awareness that I didn’t take those critiques as simply a technical critique… Those pieces of art were my statement of my belief in the Gods, and even as a teenager that was a very serious thing to me. My art has never been fantasy any more than a Christian would call a painting of Jesus a piece of fantasy. It’s taken me years to get to a place where I feel comfortable making art again, and it’s only with that comfort that I’m realizing that I didn’t just feel attacked on my talent and skill but my very beliefs. This ramble is basically just a note of thanks to those reading my blog and encouraging me to continue creating. I’m so happy to have found others who believe in the Gods as I do, or close enough that we can consider each other co-religionists. Me: I’m going to draw Freya next. Me: … Hi. You’re naked. I’m not going to draw you right now. Loki: Yes, you are. Look at me. Me: Fine! Fine! Fine! *grumbles and starts a preliminary figure study of Loki* But you have to cover up a little… I’m a prude.